Zsirozas - thanoscardgamess jimdo page! The Hungarian game Zsirozas can be played by four people in two fixed partnerships, with the partners facing each other. It is a point trick taking game. The trick is won by the last card played which is equal in rank to the led card. Sevens are wild. 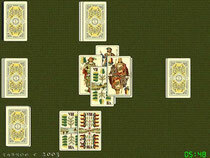 When everyone has played one card to the trick, if the winning card was played by an opponent of the player who led to the trick, the leader may stop at that point and concede the trick to the opponents or continue the trick for another round, by playing another card of the same rank that was originally led, or playing a seven, representing that rank. It is played with the 32-card Tell pack.